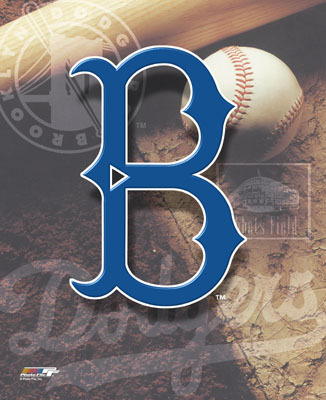 “`Prior to their move to Los Angeles, the Dodgers were the daffy team that played at Ebbets Field in Brooklyn. They were active in the Major Leagues from 1884 until 1957, winning only one World Series in 1955. The signing of Jackie Robinson in 1947 to play in Brooklyn secured the team’s influential legacy. “`After the so-called wilderness decades of the 1920s and 1930s, the Dodgers were rebuilt into a contending club; first by general manager Larry MacPhail, and then, by the legendary Branch Rickey. They finally won NL pennants in 1941, 1947, 1949, 1952, and 1953, only to lose to the New York Yankees in all five of the subsequent World Series. The Spring ritual that provided hope, followed by immense disappointment, became an annual theme to their long-suffering fans. Wait ’til next year was the unofficial Dodgers slogan. “`To add insult to injury… In 1951, Brooklyn led the National League by a prodigious 13½ games in mid-August over their arch rivals, the Giants. However, they caught the Boys of Summer, which forced a three-game playoff. It came down to the final contest. Brooklyn seemed poised to secure the pennant, holding a 4–2 lead in the bottom of the ninth inning. Bobby Thomson would crush a stunning three-run walk-off homer from the Dodgers Ralph Branca to secure the NL Championship for New York. To this day, Thomson’s home run is known as the Shot Heard ‘Round the World. “`One final indignity… The year after Dem Bums clinched it all, Yankees pitcher Don Larsen pitched the only perfect game in World Series history, and the only post-season no-hitter for the next 54 years. The Dodgers lost in seven games in 1956. “`The Dodgers remained in the Flatbush neighborhood of Brooklyn for just one more season, before they ventured to the West Coast. 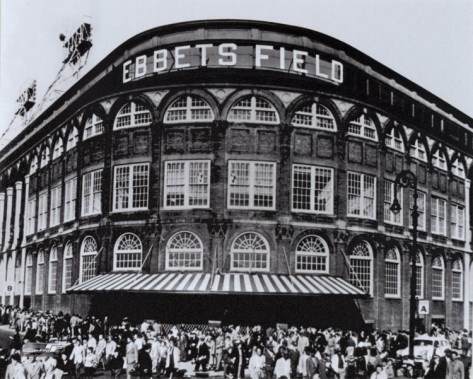 Ebbets Field was one of several historic Major League ballparks demolished in the 1960s. Today, apartment housing replaces the famed ballbark. “`After moving to California, the Dodgers have played in 19 World Series; nine in Brooklyn, and ten in Los Angeles. Currently, the Dodgers are searching for their seventh World Series championship. They are tied 2-2 against the Houston Astros, a team that has never won a World Series; competing in only their second Fall Classic. “`Like historian Doris Kearns Goodwin, I root for the Dodgers. I’ve waited almost thirty years for their next World Series victory. This entry was posted on Sunday, October 29th, 2017 at 12:02 am	and is filed under Blog by Manny Pacheco. You can follow any comments to this post through the RSS 2.0 feed. Responses are currently closed, but you can trackback from your own site.